Beetroot is an extensively cultivated crop that is a sought after superfood due to its high nutritional value. Beetroot is best known for its nutritious deep crimson roots. However, the leaves can also be used in cooking, which tastes a lot like spinach. Beetroot is known to reduce the risk of certain diseases such as obesity, heart disease, diabetes and overall mortality. According to an article in MedicalNewsToday.com, beetroot is an excellent source of nitrates that help lower blood pressure and the subsequent risk of suffering cardiovascular disease. Beetroot’s high nitrate content also enlarges blood vessels and boosts oxygen levels in the blood. The fiber-rich beetroot is also known to have cholesterol-lowering properties that are beneficial in maintaining a healthy heart. Beetroot contains high levels of a potent antioxidant known as alpha-lipoic acid. Alpha-lipoic acids in beetroot are known to reduce blood sugar levels, increase insulin sensitivity and prevent oxidative stress in patients with diabetes. 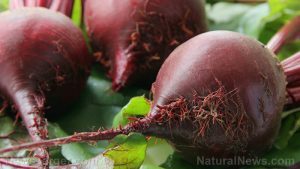 The beetroot’s high alpha-lipoic acid content is also known to reduce peripheral neuropathy and autonomic neuropathy symptoms in these patients. The vegetable’s high fiber content is also touted to prevent constipation and promote regular bowel movement for a healthy digestive tract. Beetroot’s soluble fibers are also known to fend off fat, making the vegetable an ideal weight loss food. In addition, beetroot helps eliminate toxic chemicals and excess water from the body. The high choline content in beetroot is also essential in maintaining healthy brain function. Eating beetroot may promote blood flow in the brain, thus reducing the harmful effects of cognitive disorders such as dementia. Beetroot’s high choline content is also shown to promote sleep and boost muscle movement. In addition, the choline content in beetroot maintains healthy cellular membrane structure, facilitates fat absorption, and curbs inflammation. Beetroot is also notably high in calcium and other important minerals — such as silica, magnesium, Vitamin C, and folate — that promote bone health. The vegetable also contains high levels of important antioxidants that stave off more serious conditions such as colon and liver cancers. The antioxidants in beetroot also dampens the effects of aging, thereby promoting healthy skin, hair. and blood. The carotenoids in beetroot helps maintain the hair’s thickness, while its essential minerals improve blood flow in the scalp. Beetroot is essential to the body’s overall health. The vegetable is known to benefit the circulatory system by detoxifying the blood, lowering the body’s cholesterol levels, and reducing the overall risk of heart diseases. Beetroot is also important in the body’s digestive health as it promotes weight loss and keeps gastrointestinal conditions such as constipation at bay. It is also essential in the body’s metabolic process as it lowers blood sugar levels, thus preventing the onset of diabetes. In addition, the vegetable is notably beneficial to the brain health by reducing the effects of dementia. Beetroot also benefits the bones, the muscles, skin, and hair. Being one of the most popular superfoods to date, beetroot has been incorporated in a variety of recipes including salads, sandwiches and kebabs. Beetroots are also used in soups and even milkshakes. Beetroot prevents diseases including heart disease, diabetes, and cancer. Beetroot promotes healthy bones, skin, and hair. Beetroot benefits the heart, the brain, and the digestive system.